The kanji for the animal sheep 羊 is nothing to do with the kanji 未. In fact all the twelve animals for the cycle of 12 years were chosen arbitrarily. Last year was the year of the horse 馬, umadoshi (午年). In our modern life in Japan, the only occasions when most of us even think about those animals are if we discover that someone was born in the year of the same animal — it may be a conversation topic. Another occasion would be in December and January in choosing a design for a nengajo 年賀状 (“new years greeting postcard” /nenga’joo/), or buying an engimono 縁起物 “good luck charm,” such as the one on the right. By the way, Japan celebrates new years day, 正月 /shoogatsu/, by the Gregorian calendar (since 1873.) I used to feel awkward when a Chinese colleague would greet me cheerfully, “A happy new year,” in February, when I was already over the excitement of a new year. Now, what kind of year will the year of sheep be? I hope it is a very good one for everyone. We are going to see in this and next posts that the kanji that contain 羊 are all something good and desirable. In oracle bone and bronze ware styles, it was an image of a sheep viewed from the front – two horns that curved down at the top, and the body. This image is often in contrast with the image of the kanji 牛, whose horns were upward, as shown on the right. In the ancient times sheep had many uses. The hide was good for clothing and making a tent; wool for clothing and making yarn; the meat for nutrition; and the horns and bones for making tools, etc. Sheep were also used as sacrificial animals in religious rites. 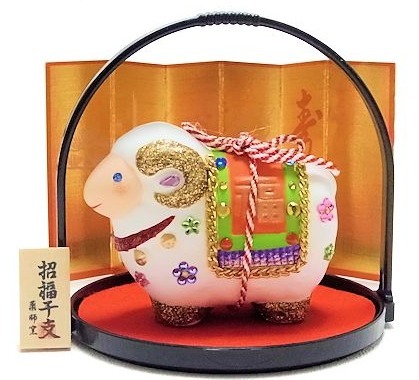 With all these good uses that sheep provided, when used as a component, the shape 羊 usually gives the meaning of goodness and desirability. The oracle bone style of the kanji 洋 had one or two sheep in flowing water. The Setsumon’s explanation was that it was the name of a river. The kanji was used to mean “ocean; abroad.” In ten style, water and sheep got separated and were placed side by side, keeping the general rule that the left side gave the meaning and the right side gave the pronunciation. There is no kun-yomi in the Joyo kanji. The on-yomi /yo’o/ is in 東洋 (“the east; orient” /to’oyoo/), 西洋 (“the west” /se’eyoo/), 洋服 (“western-style clothes” /yoohuku/), as contrasted to 和服 (“Japanese clothing, such as kimono” /wafuku/), 洋風 (“western style” /yoohuu/) and 太平洋 (“the Pacific Ocean” /taihe’eyooo/). In oracle bone style, the left side was a crossroad, and the right side had a person and a footprint. Together they meant “to go; something goes without a hitch.” In bronze ware style, the right side was a sheep to signify the scene in which a lamb was born smoothly. In ten style, the left side was the precursor to the bushu shinnyuu (a crossroad and a footprint together). From something going without a hitch, it also meant “to attain; reach; healthy; skillful.” It is also used as a plural suffix for people. The kun-yomi 鮮やかな /aza’yaka-na/ means “vivid (color).” The on-yomi /se’n/ is in 鮮明 な (“clear and sharp” /senmee-na/, 新鮮な (“fresh” /shinsen-na/) and 鮮魚 (“fresh fish” /se’n-gyo/). This entry was posted in Chinese character radicals, Japanese Writing, kanji etymology, Kanji History, Kanji Radicals, 漢字の成り立ち and tagged ひつじどし, the kanji 牛, the kanji 羊, the kanji 群, the kanji 逹, the kanji 鮮, the kanji 洋, year of the sheep, 未年.